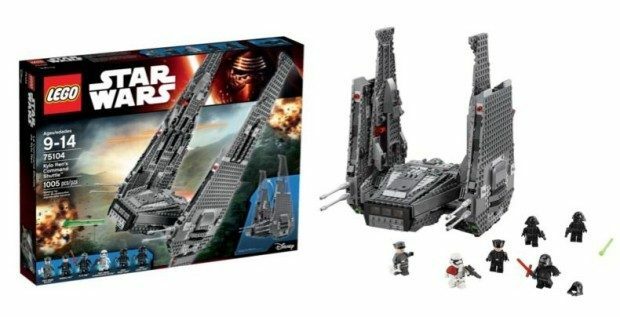 LEGO Star Wars Kylo Ren's Command Shuttle 75104 Building Kit Just $99! FREE Shipping! You are here: Home / Great Deals / Amazon Deals / LEGO Star Wars Kylo Ren’s Command Shuttle 75104 Building Kit Just $99! FREE Shipping! LEGO Star Wars Kylo Ren’s Command Shuttle 75104 Building Kit Just $99! FREE Shipping! Check out this awesome Christmas gift idea! LEGO Star Wars Kylo Ren’s Command Shuttle 75104 Building Kit just $99 at Amazon down from $119.99! And FREE Shipping! Get yours now before it’s gone!